This planet is a hot Jupiter, meaning it's a massive gas giant that orbits in tight proximity to its star. That may not sound like home, but its star could double for our Sun... if you ignore its location. This artist's conception depicts a newly discovered solar system in the Beehive Cluster, a conglomeration of over a thousand stars that all seem to move around a shared gravitational center. This particular cluster is still newly formed, relatively speaking, and it's the type of cluster where all the stars formed at the same time from the same giant cloud of dust and gas. A huge number of stars form in clusters such as these, so it's been a crucial question for astronomers to determine whether stars in clusters like the Beehive could support planets. Before this new discovery, we had detected a pair of planets orbiting stars in clusters, but these stars were super-giants. These two newly found planets, which have the catchy names Pr0201b and Pr0211b, were discovered around a pair of Sun-like planets. They're both hot Jupiters, which means they're completely incapable of supporting life. But if an Earth-like planet formed around either of these stars — and the presence of the hot Jupiters suggests that's not an impossible proposition — then the view of the star from that world would be much the same as our own daily view of the Sun. But the night sky would be an explosion of starlight unlike anything we can easily imagine. 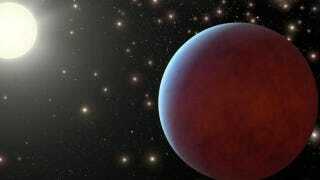 "The relatively young age of the Beehive cluster makes these planets among the youngest known. And that's important because it sets a constraint on how quickly giant planets migrate inward — and knowing how quickly they migrate is the first step to figuring out how they migrate. Searches for planets around nearby stars suggest that these metals act like a 'planet fertilizer, leading to an abundant crop of gas giant planets. Our results suggest this may be true in clusters as well." Check out the NASA/JPL website for more. Original paper at The Astrophysical Journal. Image via NASA/JPL-Caltech.